At the 2016 GIE+EXPO, Michelin Tweel Technologies previewed its newest extension of the X Tweel line, the Michelin X Tweel Turf Caster for select zero-turn commercial mowers. It’s expected to be commercially available in early 2017. The airless radial caster tire-wheel assembly replaces the standard 13X6.5X6 front caster tire and wheel on zero-turn mowers. The Michelin X Tweel Turf eliminates downtime from punctures and is maintenance free, according to the manufacturer. This new version of the Michelin X Tweel Turf is designed for landscape professionals who deal with expensive and inconvenient downtime associated with flat tires on commercial mowers. 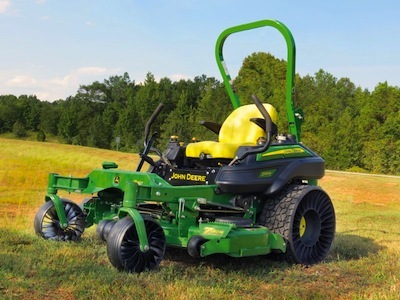 Michelin Tweel Technologies introduced the Michelin X Tweel Turf 24X12N12 at GIE+EXPO in 2014 in partnership with John Deere. Because the X Tweel Turf caster has no air, it cannot go flat and it eliminates the need to maintain air pressure. The Tweel caster is constructed with poly-resin spokes that carry the load and create suspension-like characteristics for the front of the mower. This structure absorbs impact and reduces bounce for improved operator comfort while also maintaining a consistent height for a uniform cut. The caster’s durable, poly-resin tread also provides long wear life.